Melvin L. Newmark, a longtime lawyer and leader in the Jewish community in St. Louis, died of lung cancer Wednesday (Jan. 22, 1992) at a hospital in Palm Springs, Calif. He had been in California on vacation. Mr. Newmark, 79, of Creve Coeur, was in private practice for more than 55 years. He had been a labor arbitrator since 1977. In recent years, he was counsel to the law firm of Gallop, Johnson & Neuman. A pioneer educator in the field of forensic psychiatry, Mr. Newmark taught the first course in that field at Washington University School of Medicine. He served as municipal court judge of Olivette from 1962 to 1967. He was honored in 1966 as outstanding municipal judge by the Missouri Municipal and Traffic Judge Association. Jim Lawrence, a longtime friend and client, and a former editor of the Editorial Department at the Post-Dispatch, said Thursday: The remarkable thing about Mel as a friend and a lawyer was his thoughtful and judicious temperament. 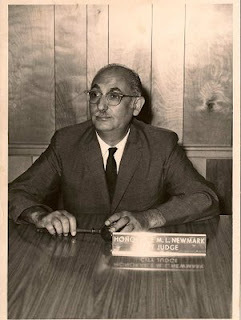 In the 1950s and 1960s, Mr. Newmark was legal adviser and helped to establish the old Gaslight Square District and Crystal Palace. He was a past president of many Jewish organizations, including the United Hebrew Temple; the St. Louis Jewish Light; the Anti-Defamation League of B'nai B'rith, Missouri Region; and the Missouri Lodge 22 of B'nai B'rith. He was a past chairman of the Institute of Judaism. He was also a past president of the Washington University Alumni Federation and of the Washington University School of Law Alumni Association. He was a member of the board of directors of the St. Louis Jewish Federation, as well as a board member and officer of numerous other community organizations. He was a member and senior counselor of the Bar Association of Metropolitan St. Louis and the Missouri Bar. Mr. Newmark was born in St. Louis and earned his law degree from Washington University Law School. In World War II, he served as field director with the American Red Cross in the Southwest Pacific Theater. A funeral service will be held at 2:30 p.m. Sunday at United Hebrew Temple, 13788 Conway Road, Chesterfield. Burial will be in United Hebrew Temple Cemetery. Among the survivors are his wife, Sissie Newmark of Creve Coeur; three sons...; a brother, Harold Newmark of Hilton Head, S.C.; and eight grandchildren. Memorial contributions may be made to the St. Louis Jewish Light, 12 Millstone Campus, St. Louis, Mo. 63146; or to Washington University School of Law, St. Louis, Mo. 63130. 1) My grandfather had an impressive list of achievements, though I remember him for his love of crossword puzzles, his appreciation for a well cooked meal, and the smile he constantly wore on his face. 2) My best guess for a date on the photograph I have included above would be 1962. He was a municipal court judge from 1962 to 1967, and his desk is clear, so I suspect it was taken on his first day. Helped establish Gaslight Square? Fascinating. As is the forensic psychiatry.